Tried a different angle in embroidering a rose today. Usually the circle forms the base for BE and that creates a perfectly round flower. For this one, I tried ...ummm...don't know to describe the shape.. 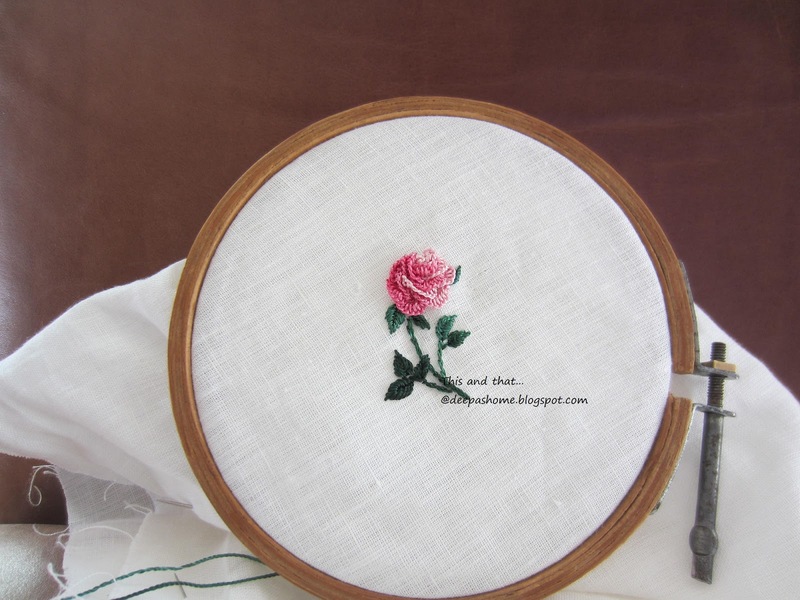 I have used bullion stitches as well as cast on stitches for the petals and of course Lola Edmar rayon threads. Does it require one more petal on the lower right? This, my dear friends, is dedicated to all those who still visit this blog. Love to you all.. Such a pretty rose! I agree though that it might benefit from another petal on the lower right. Beeeeautiful rose and foliage - and of course your impeccable embroidery ! I like the slight asymmetric look of the rose - gives it an even more natural appeal. My opinion is to leave it as is, without another petal. The graceful curve of the stem make it come alive too. I love it how it is, offset. It's more natural and more interesting than a 'perfect' shape. Well done, it's beautiful. No, I don't think it does need another petal. It's beautiful just as it is! It is beautiful as it is, Deepa, but I think it would look good with another petal! It's a pretty rose. I think you could add another petal, but I like how it looks now too. Decisions, decisions! Hi Deepa. Thank you for blogging about your embroidery and crochet. I really like all that you do. You are talented and sharing the beauty you create with us. Thanks. It's elegant and lovely as it is. Love the rose Deepa and keep blogging. Love to hear what you want to share.